TSD Competition Grade 0.20g BBs are unassuming at first look, but quickly capture your airsoft heart with their undeniable expertise in serving you not what you want, flashiness and excitement, but what you need – relentless performance. A stellar ammo option for any gun in the 280-350 FPS range, requiring 0.20g BBs. While their questionable packaging doesn’t fit their reputation, their full attention in creating a remarkably durable and accurate airsoft BB make up for it a thousand times over. A well established brand in airsoft BBs, TSD 0.20g BBs show no hint of going out of style. 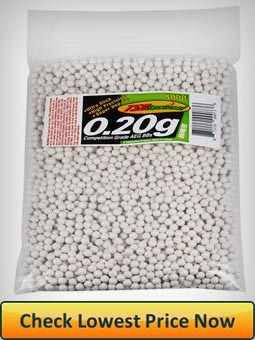 Regardless of the specific brand, all 0.20g BBs enjoy uses in a wide variety of airsoft guns. Mainly, they are used in airsoft weapons in the of 280-350 ft/s range. TSD BBs do not differ in that aspect. You can’t go wrong using them in intermediate gas and spring pistols, low to mid powered AEG’s, SMGs and entry level sniper rifles. If you own anything above that, in power and price, you may be better served looking at heavier BBs – specifically 0.25g and 0.28g. For the most part, and oversimplified, mid-priced guns above $80 and below $150 should accept TSD BBs splendidly and produce great results in combat. 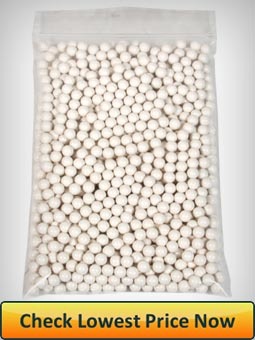 TSD 0.20g BBs are one of the most popular airsoft pellets in their weight class, with an estimated 15 million BBs sold every year. They are white in color and 6mm in diameter with a tolerance of less than +/- 0.01mm. Similar margins of error are observed when it comes to their pellet weight of 0.20g. They are 100% seamless, double polished, and designed for high precision competitive play. TSD BBs are sold in several sizes. Mainly 1000 count feeder bottles, 3000 count and 5000 count plastic bags. I wasn’t impressed the first time I glanced at a bag of TSD BBs. They don’t exactly impose a sense of quality and manufacturing prowess. It seems like TSD is partial to the good old engineering mantra of “Function Before Design”. While they may look unimposing, their level of craftsmanship is akin to only the very best the 0.20g BB market has to offer. TSD BBs have no seams or creases. They are a bright and constant white with a polish that make them shiny and slick, aiding in both the magazine feeding as well as the hop-up backspin application while shooting. TSD’s high level of expertise in manufacturing has effectively minimized any chance of gun jamming. In fact, TSD BBs have never ever jammed any of my guns. I have never come across any significant imperfections either, they all look and feel completely the same. This is crucial in offering a consistently high degree of accuracy. TSD BBs have been on the market for many many years. It still boggles my mind to this day how such a reputable brand, producing such an awesome product have never improved their packaging. While they’re 1,000 count BBs are sold in an industry standard feeder bottle, their regular 5,000 count BBs packaging seems stuck in the 1990s. TSD take the cake when it comes to engineering the thinnest plastic bag. Most orders of the 5,000 count option come in an extremely thin and fickle plastic bag. The bag features a resealable zip lock or an adhesive flap, depending on the batch, that function without hiccups and rarely cause issues (unlike the the MetalTac resealable zip lock, which is prone to peeling off). I love TSD, but I’d bet my bottom dollar – if you buy their BBs long enough, it’s just a matter of time before you pop your “Ripped-My-TSD-Bag” cherry. It will happen. Admittedly, it’s a pet peeve of mine and I might be overreacting. It does become an issue when it rips during shipping though, as BBs will fall out and/or get dirtied by the shipping box they come in. I had this happen to me, which resulted in a somewhat lengthy BB washing process to ensure the dirtied BBs wouldn’t damage my gun. The last thing I’m going to do is destroy my $300 gun because of dirty plastic balls. TSD’s durability is impressive and commendable. I’ve personally never had or heard of anyone having problems with TSD BBs breaking inside their guns. This may be just a statistical anomaly – true. But here are my two cents. Because of their superiority in craftsmanship and manufacturing, I do believe that TSD have found a way to maximize durability without going over the 0.20g weight restriction. This unequivocal advantage over their competitors is yet another reason why TSD is one of the market leaders in 0.20g BBs. Are they unbreakable? Of course not. I do believe, however, that they are one of the most durable 0.20g BBs you’re likely to come across. When it comes to pricing, TSD know their brand value very well. Due to their unwavering confidence in their high quality products and industry wide reputation, TSD prices their BBs above some of their competitors. To be fair, the pricing is far from expensive and I would still definitely qualify it as affordable. Their pricing policy is a bold move, since it’s in stark contrast to some of their biggest competitors – Valken and MetalTac, which opt to price their airsoft ammunition much more attractively. There is little to say when it comes to accuracy other than they fly true and as expected. Their uniform manufacturing make them fly and behave in in a consistent manner. It’s a joy to shoot them and be able to accurately predict their flight path. Truly a very accurate airsoft ammo. One which I wouldn’t hesitate to use in competitive play. TSD 0.20g BBs enjoy a well earned place among the top of airsoft BB brands. While some may call them bold in choosing to ignore customer demands, both in packaging and price, I believe they simply know where to focus their efforts – in manufacturing the best 0.20g BBs airsoft has to offer. A goal they excel in. Have you used TSD BBs before? Let us know what you think about them in the comments below. If you have any questions make sure to leave them below as well and I’ll get back to you ASAP!